While browsing in Marks & Spencer recently, I found myself lusting after this huge Autograph Makeup & Beauty Bumper Gift Set. It was originally priced at £60 but it was reduced by 60% to £23.99 in the January Sales and I just knew that I had to have it! It's such as sophisticated looking gift set and there are plenty of things in here I know I will be able to wear and appreciate on a daily basis. This set also represents great value for money as it contains several permanent products from the Autograph beauty range that cost quite a lot when bought individually. For instance, the perfume alone usually retails for £18.00 and this entire set was £23.99! There are also some limited edition rose gold themed products in this set that are very on trend. Probably my two favourite things from this set are the Autograph New York perfume as it's a very beautiful and ethereal fragrance that's a nice dupe for Channel's Allure fragrance. The Autograph Eyeshadow Palette is also gorgeous with it's sleek rose gold packaging and beautiful rosey pink toned eyeshadows that remind me a lot of the Urban Decay Naked 3 palette. Here's a breakdown of exactly what I got in this set! - "Limited edition palette with 12 sophisticated shades for eyes." - "Rose gold Limited edition." - "Rapid dry formulation with an even and high-gloss coverage." - "This ultra-glossy lip gloss adds some shimmer to your smile. Lightly flavoured and Anti-feathering formula." - "The rich sensual feminine fragrance blendes top notes of bergamot, gardenia and apricot with heart scents of damask rose, jasmine and warm woods and sensual base notes of velvety musks, creamy sandalwood, vanilla and heliotrope. An opulent fragrance to leave your skin shrouded in luxury." - "The ideal solution for tired and dull skin. Helps to brighten the complexion, enhancing the skin's natural glow and helps your make up stay in place." - "Precise and highly pigmented propelling eyeliner. Long lasting and transfer resistant." I'm really happy with this set and it was definitely an exciting January Sale find for me. 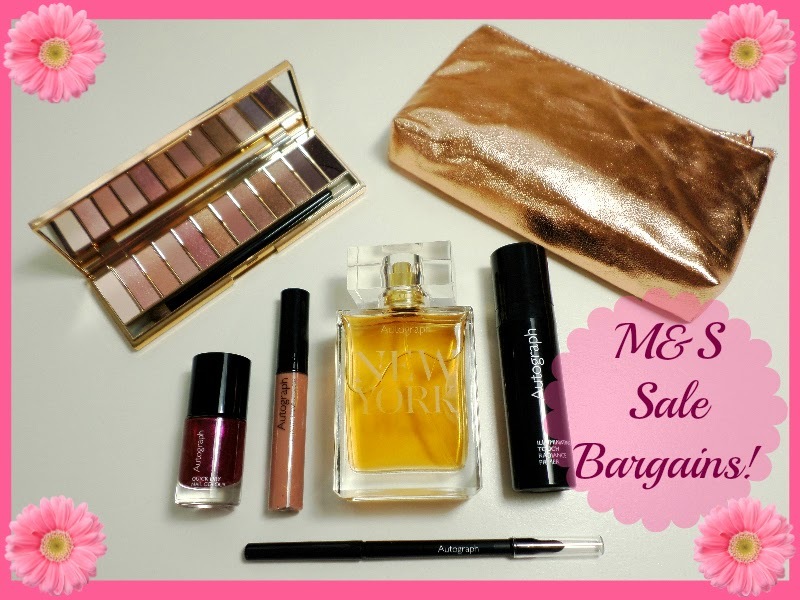 If you're looking for more bargain beauty hauls, you can see more of my recent January Sale shopping posts here (NYX On Sale) and here (Boots 70% Off Sale). Have you found anything exciting in the January Sales this year? P.S. I also made a video if you want to see more about this Marks & Spencer Autograph gift set!